"I'm an alien from outer space... I'm a cybergirl without a face a heart or a mind..."
Janelle Monae, "Violent Stars, Happy Hunting"
One of the catchiest songs I'd heard in a very long while, Janelle Monae's "Violent Stars, Happy Hunting" was in a genre of its own. It seemed that we were on the verge of assaulting popular consensus of Black womanhood, no matter who was ready. Metropolis: Suite 1 (The Chase) was Monae's definitive break into a wider audience. I heard a few of her lesser known singles as straight R&B/Pop prior to how we know her now. Her melodic patterns, layered lyrics, and forward imagery has kept me on board. Monae represents an offshoot of my own personal affinities which made her personae oddly familiar. What gets people similar to myself excited about artists like Monae that emerge that is they're a part of an evolving movement of identity politics in Blackness and Black culture. In order to invert boxes and one-note stereotypes, there constantly has to be opportunities for the contrary to flourish as an example of a multipicitous wholeness that exists in every human being on this planet. History notes that the socialized race system we adhere to has played a role in disadvantaging people of color on this quest. In comes Afrofuturism; re-rooting the past to mark a place for those of African descent and their rightful place in science, technological advancement and the relationship, delightfully complex as it is, with artistic expression and building culture on terms that makes us the purveyors of our own destinies, transcending space and time limitations. Afrofuturism is a word I've familiarized myself with just this year. In the not so distant past, I've heard it thrown around but never put forth the effort to investigate its history or deeper meanings. I felt that I had "gotten it" and LaBelle were some of, if not the first female group to take on the cultural aesthetic. But with the advent of #SciFiSunday on this site and Twitter, I allowed room to expand my knowledge of this productive space. Considering the intimate relationship with science fiction and horror, it was inevitable. Afrofuturism is a free space for women, a door ajar, arms wide open, a literal and figurative space for black women to be themselves. They can dig behind societal reminders of blackness and womanhood to express a deeper identity and then use this discovery to define blackness, womanhood, or any other identifier in whatever form their imagination allows. The build up to this statement challenges Black women artists to "create their own stories" by refraining from borrowing. To conceptualize "a postapocalyptic world in which only black women and white men survived" and sister shape shifters as examples. The work produced by these women: uncategorizable. Further consideration into the sci-fi/horror amalgam, what stories have yet to be told that take on this approach successfully? 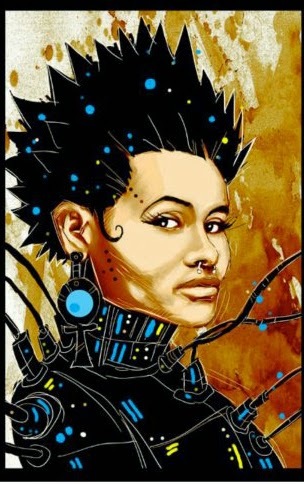 How can blackness and womanhood be redefined in the science fiction genre?